Coconut nutrition can best be used for weight loss, cooking healthy foods, and curing infections, diseases, and preventing yeast overgrowth. History of coconuts and facts about coconut oil fat, cholesterol, and calories are shown here in the below chart. 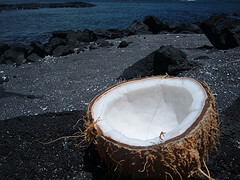 People of the Pacific Islands and Asians have enjoyed the health benefits of coconut nutrition for thousands of years. They've used it as a primary food source and as a medical cure for certain ailments. The word coconut is said to have derived from Portugal in which the word “coco” means grin. This was similar to the 3 pores or “eyes” (as they are sometimes called) in the coconut that resemble a face. They grow in humid tropics. The exact origin is still a mystery to scientists due to the fact that they can travel by water and end up on a far off land. But there has been references of coconut usage as far back as the 5th century. Some scientists believe they could have originated from either Polynesia or the Indian Archipelago. Major countries that export are Papua New Guinea, Zanzibar, Solomon Islands, Fiji, Samoa, Malaysia, Thailand, India, Indonesia, Philippines, and Sri Lanka. Disease and drought also has an affect on the growing capacity of the coconut palm (Cocos nucifera). The growing location is important for the best coconut nutrition. The coconut is the fruit of the coconut palm tree (botanically it is not a “tree” because it has no bark). In botanical terms, it is considered a drupe. A drupe is a fruit with a hard stony covering surrounding a seed, such as a peach. The word drupe is derived from the Latin word drupa, which means overripe olive. A coconut is not a true nut because a true nut does not open at maturity. The coconut has 3 layers. The smooth outer layer is called the exocarp, the fibrous middle layer is called the mesocarp, and the woody area around the seed is called the endocarp. Every part of the coconut can be used for coconut nutrition. Products include shampoo, soap, clothing, decorations, charcoal, food, shelter, fertilizer, and more. Some of the more popular brands include Garden of Life Coconut Oil, Nutiva Coconut Oil, and Zico Coconut Water which is one of several coconut drinks. Coconut oil can be put into capsules just like any other oil. Capsules are sold in stores as gelatin or vegetarian. Powders and liquids can be inserted in the tiny clear pill for easy storage. For the most part, people who use these capsules are looking for convenience and better pricing compared to high prices in health food stores. Often the oil is not easily found if you don't live in a tropical area so capsules may be the only available option if you're trying to get coconut nutrition. It should be said the fresh organically grown coconut oil is highly superior to processed/refined versions that have been encapsulated. The nutritional value goes down during the refining process. You can use the oil for cooking at room temperature which is liquid form, or in solid form. It solidifies at 24°C (175°F) and can go rancid and not be suitable for food purposes. If it smells funny or looks funny it should be thrown out. Know the source of your coconut oil. Choose a brand/manufacturer that provides organically grown coconut groves. Special care and strict guidelines should be followed to ensure the quality remains intact up until purchase. The oil should be kept refrigerated to prevent rancidity and prolong shelf-life and to get the best benefit out of coconut nutrition. Virgin organic coconut oil can be used for HIV (AIDS) management, vaginal yeast infection cure, male yeast infection cure, baby yeast infection cure, Candida albicans, weight loss supplement, oil for cooking, massage oil, hair treatment, and skin moisturizer. The four components that make it so healthy is its caprylic acid, lauric acid, caproic acid, and capric acid. These medium chain triglycerides (MCTs) aid in digestion, fights viruses, bacteria, yeasts, and fungus infection, and strengthens the immune system. If you have a yeast infection problem, you would take a tablespoon of the oil twice daily until symptoms are gone. Then, only occasionally to prevent symptoms from reoccurring. See the page titled home remedies for yeast infections. AIDS patients or people suffering from severe conditions should speak to a natural-path or alternative doctor for suggested medicinal oral application purposes. As explained above, if you are cooking with coconut oil, apply a small amount, usually enough to coat the bottom of a pan and fry, bake, or broil as usual. You can receive the benefits of coconut oil on your hair and skin as well. Just apply a small amount in the palm of your hand and apply to your hair nightly being sure to run your fingers through your scalp. Wash your hair the next day if needed. Or, you can leave a small amount in your hair throughout the day. It can be used as a message oil or simply as a skin moisturizer by applying to the needed area. There's no need to over due the application because a little bit of the oil goes a long way. In India, coconut is a more common food allergy. But compared to the United Kingdom, Australia, and the United States of America, coconut allergy is a rare occurrence so coconut nutrition is easier to obtain. Mountain Rose Herbs is a trusted company that consistently delivers quality organic products. They specialize in certified organic herbs, spices and botanicals. Organic farmers must adhere to strict principles and protocols that ensure the best possible products. With the method of extraction that uses temperatures less than 100 degrees, it allows the coconut to maintain its nutritional properties. These powerful nutritional properties can be used as a defense against Candida albicans infections and many other illnesses. Take a look at their product page for more details.